1992 seems like a lifetime away, and I guess it was if you are 20 years old. 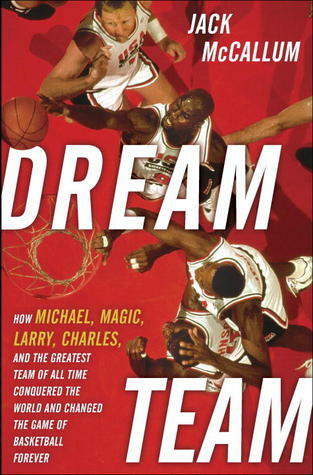 For those of us who can actually remember 1992 and were basketball fans even then, “Dream Team” is a treat. Now, there has been a recent claim by one Kobe Bryant that the 2012 incantation of the U.S. Basketball team could defeat the 1992 Dream Team. My only response to that is a gut busting laugh, because he must have been joking. Michael Jordan laughed as I did, and while admitting that the new guard may have a physical edge, they aren’t as smart. I would also venture to guess that there are few players today who are as competitive as the ’92 squad. Jordan, Bird, and Magic took competitive to a whole other level. Today’s players only care about personal stats and money; winning is secondary to the other two goals. I’ve read quite a bit about Bird (one of my favorite athletes of all time) and Magic, and through their words and this book I have come to a grudging acceptance of Jordan’s greatness. These three together just had a head for the game, they learned how to work as a team, they had a killer instinct, and they never shrunk from the big moment. Basketball experienced a complete renaissance in the 80’s early 90’s and it culminated with the Dream Team. The Dream Team proved to be a boon for international competition, bringing the game to a worldwide audience and creating new basketball fans and players in far off lands. No matter how good players get, I find it highly improbable that any proceeding team could ever be as good as that one. This is a great read for the Basketball fan and historian.